Top Notch Material: Silicone Molds: Create Cakes and Popsicles this Summer from Haba! Silicone Molds: Create Cakes and Popsicles this Summer from Haba! I was recently asked to review some summer fun-type items from Haba, and I agreed to review a few of their silicone molds. I really had no experience with these types of molds prior to this review, but have started to take a cake decorating class, so I was anxious to try out some of my new skills with these Silicone Molds from Haba! The first mold was the Silicone Snake Mold. 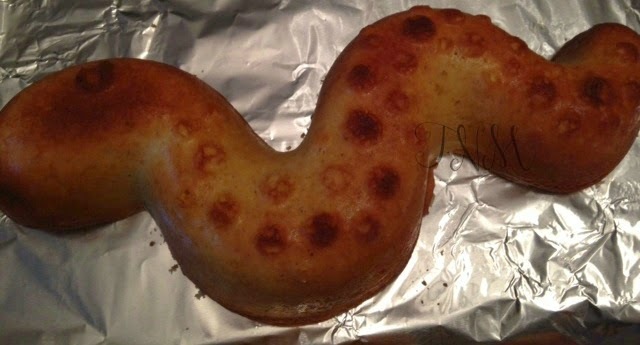 This mold retails at $18.04, and creates such a fun cake snake! Even though this mold can be used as a jello mold in the fridge, or even a fun icecream or icee type treat, we love the cake version best! The possibilities are really endless since this fantastic mold works for both baking or freezing. The friendly snake is fun for children, and my boys loved helping me make "cakey snake!" While I have not had the chance to try out the Silicone Cake Mold Summer Flower ($21.37) (there is only so much cake I can make in this house without all of us becoming obese) I know I will love it just as much as the snake mold. I simply sprayed the mold heavily with bakers spray, placed the mold on a cookie sheet, and just cooked it until it looked done. As you can see, it turned out perfect, and EVERYONE in my family was impressed with the flavor. 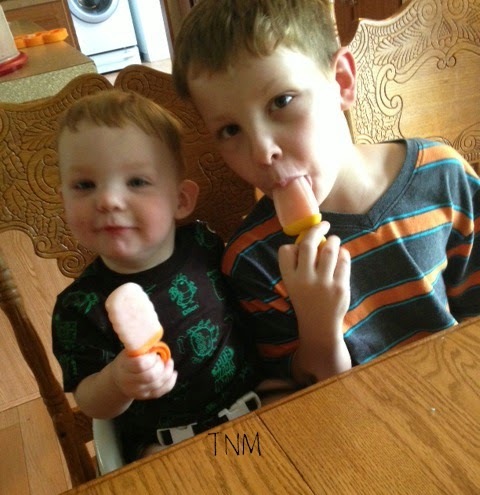 We also received the Magica Silicone Popsicle tray ($17.09) which my oldest just LOVES! The first time, I combined yogurt, juice and fruit to make a healthy cool pop for them! With the temps in Florida soaring to over 90, we definitely need a way to cool down! Both of my boys were very impressed with this creation, and neither seemed to notice just how healthy of a snack they were eating! Then my oldest made his own creation. I think he added banana pudding, milk, and topped it off with a little Hersey's syrup. Not as healthy, but his own creation, and he was totally happy with the results! Next time, I will be experimenting with more fresh fruits and sugar free juices to really mix it up a bit! As you can tell, I will be having a ton of fun all summer long with my super fun silicone molds from Haba. Who knew a "toy" brand could make such fun items for the kitchen too!? Win It: One lucky will receive all of the items listed above! That is over a $56 value! I'd love the Animal Threading Beads! I would love the Wooden Noahs Ark set. I find that there would be a lot of creative play with that one. Not only the story of Noah also, they could make up other animal stories. I love their dolls, too. Baby Chloe is adorable. And Annie is cute, as well. Their Pushing Car Walker Wagon is adorable. A little out of my price range, but none the less cute!